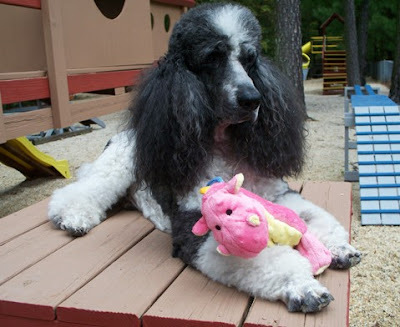 Poodle Blogger: Happy Birthday to Smartest Poodle I've Ever Met! Happy Birthday to Smartest Poodle I've Ever Met! Happy Birthday to Charlene and Glenn Dunlap's special boy "Jyah", who turned 12 this week, on October 15th! Jyah is pictured above enjoying his birthday toy (Jyah loves dragons, I guess that happened when he was working on one of his movies which featured a dragon as a co-star!) Seriously, although I had met dogs who had small parts in commercials and even a TV Movie, Jyah is the first Poodle movie star I ever met, back when he was just a youngster. I was drawn to him the second I saw him when I went to Canine Horizons for a seminar. From that site, there is a link that will take you to pages that chronicle the training, including videos, of the newest members of the Dunlap family, Joey and Scotty (who are also gorgeous parti-colored Standard Poodles). 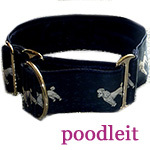 On the original Canine Horizons website, you can read about the history of this color in our breed. The parti-colors, in fact, all colors and markings have become more popular since the United Kennel Club voted to allow them to compete towards UKC conformation championships. In AKC shows, partis can be shown in performance events, such as agility, rally and obedience, but not yet in conformation. Below is a recent photo of Jyah with his best friend Sydney (isn't she lovely?) I was privileged, many years ago, to have these two special dogs come for CGC training classes back when I owned Bed & Biscuit, before I moved to Virginia. 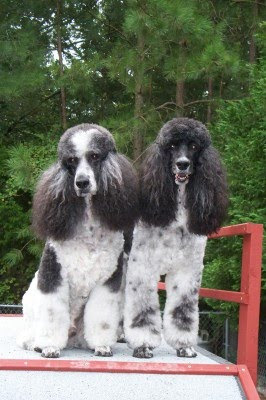 They were also stars at our Poodle parties, as well as our weekly fun Poodle socialization classes. I miss those days, not just B&B and dog training, but I miss being close enough to jump in the car and go down and visit the Dunlaps and their Poodles (who then lived only about an hour away from us). All to say, if you have special friends, both human and canine, love them with all your heart while they are close to you, in case some day life circumstances change and you aren't able to see them as often. But I digress...HAPPY BIRTHDAY JYAH, and best wishes for many, many more!